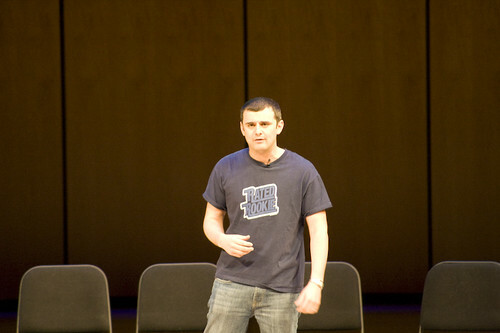 Gary Vaynerchuk – He’s changing more than just the wine world. Last night I got back from Miami where I attended BarCampMiami (which Clearspring graciously sponsored) and Ryan Carson‘s one-day conference the Future of Web Apps. One of the things that I was looking forward to the most was meeting Wine Library TV‘s Gary Vaynerchuk. As you know if you’ve been reading this blog for a while, I have a TON of respect for him. I’ve been watching his show for a while and love what he’s doing. Well Gary beat me to the punch. There was a break between sessions. I was headed up to the foyer to grab some much needed caffeine and chit chat with other developers who were there. I wasn’t fully paying attention to what was going on and out of the blue I hear this New Jersey accent say, “What up J Thorp!” It was Gary V. himself. We chit chatted for 2 or 3 minutes and then he had to run off and do somethings because his talk was coming up. He was closing out the conference. Side note – Kudos to Ryan Carson for AMAZING book ends to the conference. He started with Kathy Sierra and ended with Gary Vaynerchuk. They were both the best speakers of the entire show. While all the other speakers spoke from slides and notes, Gary just talked. You could tell what he was saying was from his heart, which is really cool. The main message that I took away from it was that if you’re going to do something, love what you do. If you don’t love it, it will show, which is SO true. You have to believe in the cause you’re working for. Secondly, I think his message was that you need to be sold out to your users. Your customers and their thoughts and needs are the most important thing. I’ve heard my friend and social media extraordinaire Shel Israel talk about how if you want to get you first have to give, which is right inline with what Gary was talking about. Gary talked about how, even up to right before he went on stage, he was answering e-mails from folks who has questions about wine. He was serving his users. This is by far the reason why he has been so successful in business and why his fans are so vocal about their support of him. He’s willing to give of himself. He went on to say that if you’re a CEO and you’re too busy to have a lot of face time with your user base that you should hire a community manager. I thought this was particularly interesting considering I am now a community manager. Gary’s words of wisdom were right on. I’ll probably buy the video of the event from Carsonified just get Gary’s talk. There are so many people that I think need to hear this. So many folks have lost sight of the idea of serving. I don’t know if Gary’s a Christian but I am. In the Bible, Matthew 22:39, ‘Love your neighbor as yourself.’ Something that is talked about in every church but isn’t always show or practiced (by myself included), which is a shame. At the end of every one of Gary Vaynerchuk’s shows he says, “With you and a little bit of me, we’re changing the wine world, whether they like it or not.” Well Gary, you’re changing more than just the wine world. Wow. you just gave me an AHA moment. You are so right about the bible quote, I never put two and two together before. I’m a GV fan too, that was so cool that he knew who you were! I saw some tweets about Gary’s talk and wished I was there at FOWA. I had a chance to hang out with him when he spoke on a panel at a DC web conference I helped put together last year. I joked that I wanted to hire him at Viget to be a consultant — he’s a guy who could really advise any company on how to build communities and make real connections with people online. He gets it, enjoys it, and has an unending energy when it comes to applying it. And, even though he’s a Jets fan, he’s super chill and down to earth. Glad you got to meet him! yeah that was a great talk by Gary. I actually taped the whole thing if you want a copy. good seeing you in Miami! It was great to meet you Justin, let’s keep in touch. Thanks for the BarCampMiami sponsorship. And yes, Gary’s the man! What a rockin’ presentation, he really fired us up for the party later on. Justin, it was great meeting you this past week. You have opened my eyes to some cool things in the widget world. Gary was the man. You could feel his passion and see his heart on his sleeve. I totally agree that you need to be the face of your company, and if you can’t, hire someone who can be. Look at Bill Gates, Steve Jobs, Zuckerberg, and the list goes on and on. People love that one-on-one interaction and knowing that they are fascinated not only with your product but with you as a person. Luckily, you are a great spokesperson for Clearspring as I have already touted it to a handful of colleagues and friends. Justin, I completely agree that Kathy and Gary were the best speakers at the show, and I myself left inspired. I think there is more to Gary than just the personal brand and the dedication… he really seems to understand how to bring his users to that next level in wine by exciting them, teaching them, and building a community around them. Great to see you at FOWA. Glad you enjoyed it!! Pingback: » The Wine Biz 2.0 with Gary Vaynerchuk, Wine Library TV. Pingback: Building Personal Brand « visiblmedia. Previous Previous post: What is your pleasure model?